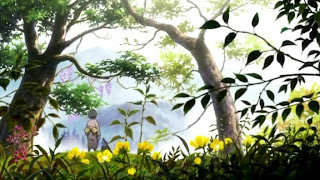 Though rather late, I finally got to watching all of Mushishi. I became rather excited about it a long time ago when Nikki found it online, right around when it actually came out. For some reason though, I just couldn't get to watching it all this time. Nevertheless, I just got the urge one day recently and went through the whole series within less than a week. Mushishi is a rather different kind of anime. For one, there is essentially no over-arching plot to speak of. Each of the 26 episodes is a self-contained plot, with very few recurring characters between them. This is anime at its low-key best. Like Niea_7, by and large it presents us with the daily struggles and mundane efforts of common people. No end-of-the-world scenario here, and to me that's rather refreshing. The main character, Ginko, is a traveling Mushi-shi, or bugmaster. His primary role is to find and control or eradicate mushi. While the word mushi itself is translated as insect, it also means to disregard, or ignore. I find this of significance, because the mushi of this anime are essences of life that are neither animal nor plant. They are ghost-like creatures comprised of energy. Most of them are harmless, but like animals and plants can have negative effects on people if disturbed in some way. Since only a few characters in the anime can see them they are often feared and misunderstood, and therefore also ignored as the translation suggests. Mushi can exist harmoniously and in balance as part of the natural world. Undesirable consequences only come to pass when humans interfere with the natural order of the world, which has created the need for those who can control the mushi in some way and restore balance. Enter Ginko-san. Part exterminator, healer, and part teacher, he travels without end. Due to his past with the mushi, he tends to attract them and must always be on the move. Yet in each episode he presents the characters with reason, a cure, or solution. Sometimes he also presents a difficult choice, as being rid of the mushi in the scenario may mean having to give something up. Something that may be very important to the characters. This brings us back to the nature of the individual plots in the series. Each episode introduces a new set of characters who have been somehow affected by a mushi, creating a significant obstacle. Often times, individuals' lives are at stake. Yet to save a life, they may have to give up something dear. At times it may be a part of their body, and at other times their entire village. In all cases, people's attachments are laid bare and difficult choices are the only resolution. I suspect that each episode's story harkens back to Japanese folklore. They all sound brilliantly fantastic and reminiscient of kami in the Shinto tradition. Whether it be the wandering swamp that comes down from the mountain, or a guardian being of a particular area. Each mushi is neither good nor bad, but simply exists as a necessary part of the world. The bottom line is that this anime is wonderfully idyllic and relaxes me in a similar way as Niea_7 does. It doesn't depict epic battle scenes, but rather presents us with a set of tales that are soothing and in some way bear a message we can learn from. 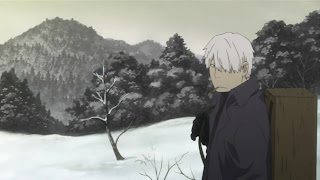 I don't want to call it educational, because that sounds too dry, but Mushishi does have a lot of depth for anyone willing to look beyond the lack of fancy sword fights. And for those familiar with Eastern though, Mushishi holds yet another interest which will be quite apparent and stimulating. My only criticism would be that the series isn't longer. It seems to have come to an end all too soon. Still, more resolution at the end may also be a plus.